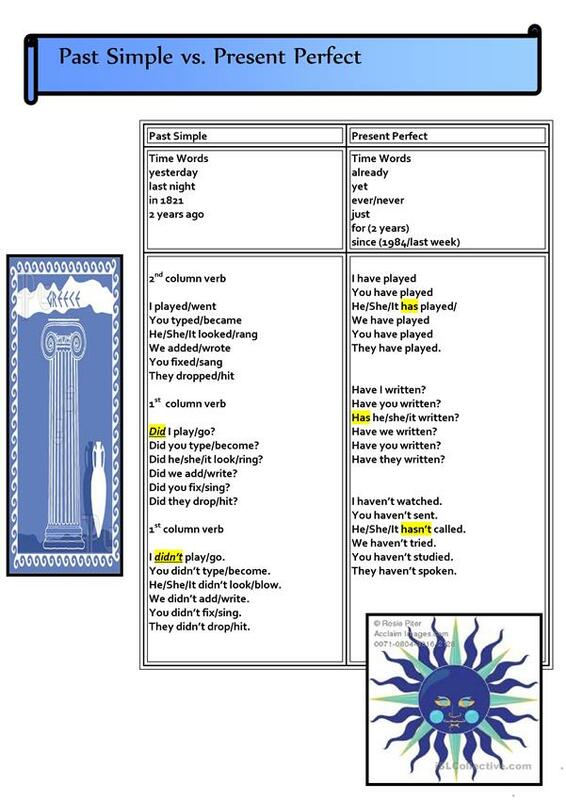 The chart shows the time words for the present perfect simple tense and for the past simple tense. Also included are all forms of each verb: affirmative, negative and interrogative. The present downloadable worksheet was created for business/professional students, high school students, elementary school students and adults at Elementary (A1), Pre-intermediate (A2), Intermediate (B1) and Upper-intermediate (B2) level. It is aimed at consolidating Present perfect or past simple tense in English, and is excellent for enhancing your learners' Spelling and Reading skills. kifissia is from/lives in United States and has been a member of iSLCollective since 2011-10-12 07:37:58. kifissia last logged in on 2019-04-20 04:57:01, and has shared 385 resources on iSLCollective so far.